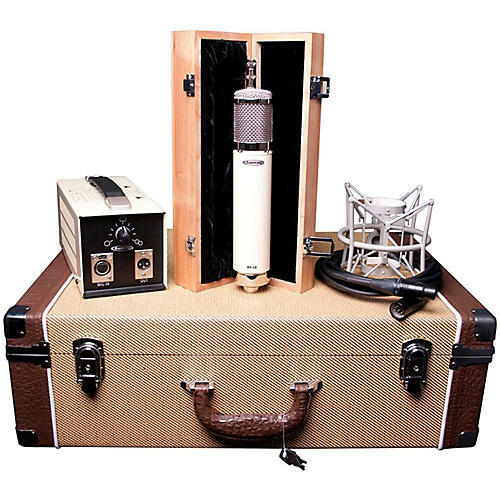 Custom tube microphone with travel case. The Avantone "Buttercream (B-series)" are premium microphones designed to offer true professional performance. They will meet or surpass the performance and specifications of some much higher priced mics. The Avantone BV-12 is truly a gorgeous looking and sounding microphone. The design, character and performance is comparable to some of the fine vintage tube mics of the 1950's and 1960's...but at a fraction of the cost. The rugged BV-12 microphone body and capsule assembly are precision machined of brass. Aesthetically, it features an elegant Buttercream baked on finish, accented with polished nickel trim and grill. The transformer coupled tube circuitry has its origins in famous European vintage designs. Manufactured using the finest materials yielding a very solid feel, superb structural integrity and rugged reliability. Any studio can proudly offer the BV-12 as a primary vocal mic as it exudes class visually as well as sonically. The included Custom Retro Shockmount is superb in allowing a precise positioning of the mic while inhibiting the unwanted vibrations up into the mic. This isolation allows for superior professional results.